Toma un acercamiento artístico a Venecia con este tour a pie de fotografía privada. Tanto si es un novato como un fotógrafo experto, encontrará infinitas oportunidades para la toma perfecta mientras explora las pintorescas calles, plazas y canales de Venecia. Un guía de fotógrafos profesionales lo guiará en un recorrido a pie de 3 horas por magníficos puntos de referencia y callejuelas ocultas, y le dará consejos sobre la iluminación y la composición a lo largo del camino. 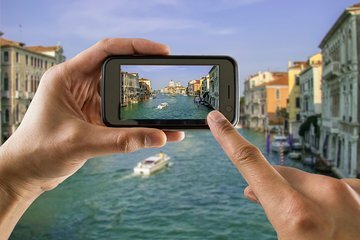 Traiga su cámara o teléfono inteligente y salga de Venecia con una colección de bellas imágenes dignas de impresión para conmemorar sus vacaciones. Disfrute de la atención indivisa de un guía en un tour privado. Con palazzos históricos, magníficas catedrales góticas y canales reflexivos, Venecia es un paraíso para los fotógrafos. Capture este ambiente increíble con la guía experta de un fotógrafo profesional local. Todos los niveles de experiencia y tipos de equipos fotográficos son bienvenidos, desde teléfonos inteligentes hasta cámaras digitales avanzadas y cámaras SLR. Elija entre un tour de 3 horas durante el día o al atardecer, y haga una lista de cualquier interés especial o solicitud al momento de la reserva para que su guía pueda personalizar su experiencia. En todos los recorridos, aprenda consejos y trucos de fotografía adecuados a su nivel de experiencia para que pueda salir de Venecia con una increíble colección de fotos que estará orgulloso de imprimir y enmarcar. Explore las bulliciosas plazas públicas de Venecia y las tranquilas calles laterales y canales durante el día. Deténgase en el histórico mercado al aire libre de Rialto y en el distrito comercial de Mercerie para disfrutar de excelentes tomas de puestos coloridos y de la bulliciosa actividad del mercado. Obtenga consejos de su guía sobre cómo fotografiar a las personas con respeto y habilidad para capturar sus movimientos y expresiones. También visitarás la Plaza de San Marcos y aprenderás a enmarcar sus magníficos monumentos de manera única y llamativa. Conozca a su guía justo antes del atardecer y descubra increíbles oportunidades fotográficas mientras el sol cae y Venecia se sumerge en los cambiantes tonos del crepúsculo. Visite muchos de los lugares de la excursión diurna, además de lugares ideales para capturar la luz dorada del atardecer. Mientras cae la oscuridad, pruebe a capturar el resplandor de las luces de la ciudad reflejadas en los canales y las obras maestras arquitectónicas iluminadas de la Plaza de San Marcos. We love Mario. He's a fantastic photography instructor. Vinicio is an excellent photography and a great tour guide. In addition to helping me with learning the functions of my camera and using manual settings, he provided a real taste of what life is like in Venice for the people that live there. I really enjoyed our conversation and took some very excellent photos. I highly recommend the twilight tour! Vinicio was a great teacher and seemed to know just where to start with these beginners. He was patient and easygoing and made it very enjoyable. Thank you! Especially in the summer months or when the cruise ships arrive, Venice is known to be crowded with tourists which makes getting into popular places, or even photographing them difficult. Unless you want photos of people standing in front of the best sights taking selfies. We signed up for this photography walking tour with the hope the guide could show us the best spots to get pictures away from the crowds and give us a hands on experience. Our expectations were exceeded. Vin took us away from the crowded central part of Venice showing us the back streets and canals where the people live. While giving basic photography tips such as composition and camera settings, he told stories of how the city evolved and what it is like to live in the city. If you want a small group, hands on experience, this is for you. Lots of walking is involved over the three hours. This one tour will net you the 10,000 steps you seek. Thank you Vinny- we loved walking around Veice with you and seeing those sites that most tourists do not experience. Vinny's advice on photography has helped us to take better photos and to be more aware of the light and composition of the shot. A fantastic tour. Excellent, makes you see Venice beyond the tourist hordes... Vinicio is a very talented and experienced photographer, with an international background. He knows Venice inside out and will take you to the less known neighborhoods, will also share with you good gourmet addresses. Highly recommended for all those interested in photography. 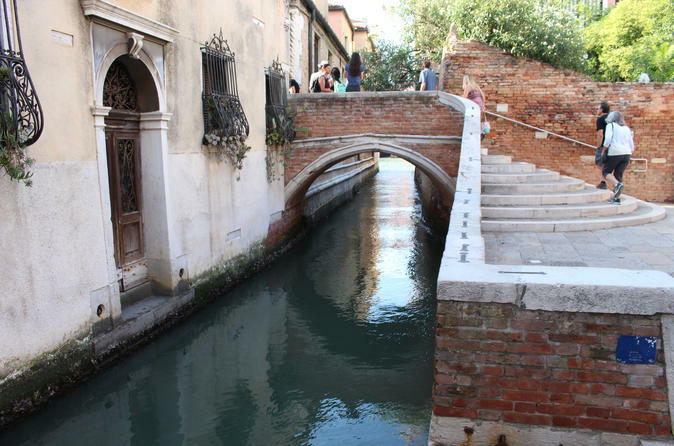 Great experience to explore the hidden areas of Venice! We had such an incredible experience with the photography walking tour. We were so appreciative of the opportunity to have a personal guide take us around and find the hidden gems of Venice. My daughter is an aspiring photographer so this experience enabled her to learn first hand how to capture the heart of the city and make the emotional connection to the locals. Highly recommend if you get the opportunity - it is well worth your time 3 hours and expense. We stayed only overnight and Venice is the first stop in our trip. We are glad we booked this tour because we were able to walk to areas we were not able to see during my first visit in Venice years back. And we got good tips which we were able to use all througout our trip. My friends and I have different cameras which we were able to familiarise ourselves. We also learned how to adjust lights for sunset and night lights. Vini is very accommodating. He answered our queries patiently even if our queries are not about photography like where to eat etc. He is also very kind to pick us up at the hotel. I love this tour because my little knowledge in photography learned thru lectures were applied in practice. Thanks a lot Vini.